SlideDog Interview with the Pied Piper of Hameln, Germany! We at Team SlideDog are fortunate to have customers from all over the world, spanning lots of different professions and industries. A few years ago we stumbled into the Church Presentation Software industry without even knowing such a market existed! Ever since we shipped the first version SlideDog in 2012 we are regularly surprised and excited when new industries and types of professions start using SlideDog for their day-to-day presentations and multimedia shows. Needless to say, there are quite a lot of interesting people among our users. Today we’ve been so lucky to get to interview the official Pied Piper of Hameln, Germany! His real name is Michael Boyer and he is one of the iconic employees of the tourist office in Hameln, which is one of several public and non-public enterprises in Germany using SlideDog. 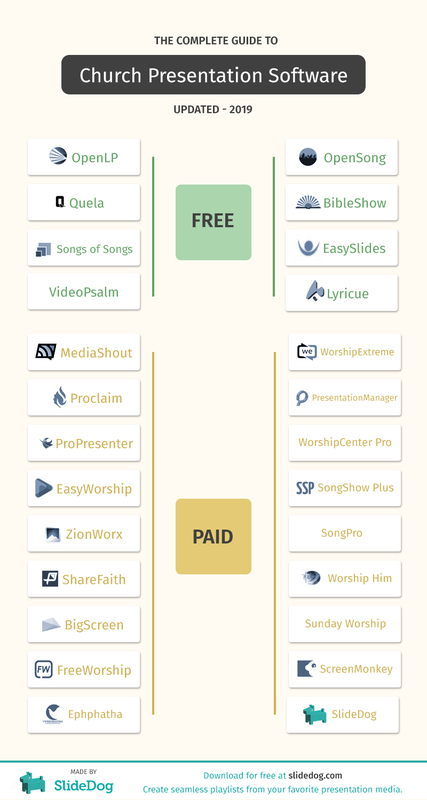 More than four years ago we wrote a short post about the free and open source alternatives to the professional, and somewhat costly, church presentation software products that were available back then. That blog post, to our surprise, immediately got a lot of attention and shares on social media. The comment section, which is still active today, was quickly filled with literal praise, questions and recommendations by our readers. It was obvious that there was a big crowd actively searching for options on how to handle the AV and multimedia content at their sermons and church services, and not many sites offering a listing of the available free alternatives. Today, in 2019, the space has gotten a bit more crowded, with more products and offers, and the amount of web sites blogging about the Church Presentation Software space has grown significantly. However, we couldn’t find a single post that offered an up-to-date listing of all the available Church Presentation Software products. And that’s when we decided to make an effort to compose such a list and dedicate our self to keep it updated. We are going to keep adding new products as they appear on the market and move discontinued products and projects to the graveyard section (at the bottom of this post). SlideDog is already a popular tool amongst churches during worship services and similar. Churches, Nonprofits and Christian organizations and their activities often revolve around helping their local communities, and some even at a global scale. We wanted to take a closer look at how pastors and leaders in these organizations use SlideDog to improve their presentations and make them more interactive. This way they can make the experience more professional and hassle-free so they can focus on what is important.